Honda Civic Hybrid is a performance oriented car that helps in saving on fuel expenditure. Its 1.3 liter i-VTEC 4-cylinder engine makes use of gasoline as fuel. Its special idle-stop feature helps in saving the gas by shutting off the engine automatically whenever you stop the car. 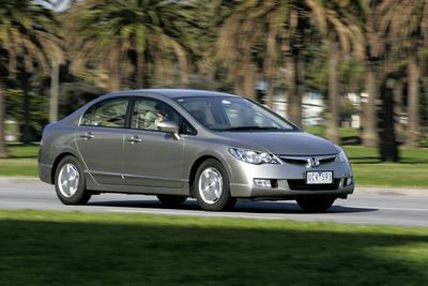 Along with high performance, the Honda Civic Hybrid also offers luxurious comforts for an enjoyable driving experience. The interiors have been made luxurious and comfortable. The seats have been designed to provide thigh and back support and have fine leather covering that gives its interiors a rich look. The car also uses the Honda Satellite-Linked Navigation System that has voice recognition facility. While the navigation system will help you in planning your travels efficiently, the voice recognition feature will personalize the system and protect it also. Another feature that can come in handy is the Average Fuel Consumption Indicator which defines the car as truly hybrid.